GAMBIT: Updates: Give me Wii-berty or Give me Death! Give me Wii-berty or Give me Death! 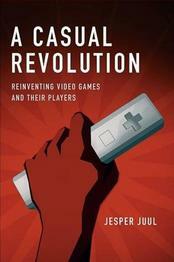 Great GAMBIT friend Jesper Juul of the New York University Game Center had his recently released book, A Casual Revolution, reviewed by the Wall Street Journal! It is a great review of Jesper's equally great book. The review talks a bit about the Wii, and the development of the controller over the years. There is even a bit about the Contra Code. Congratulations on the review Jesper, and we are looking forward to getting our crate of 1,000 free copies of A Casual Revolution in the mail for Christmas! UPDATE: You can also now read some excerpts from the book, interviews specifically, on kotaku.